Two levels deeper into BioShock 2 and unwilling to spoil any of the major events in the game, I will instead share a feeling I've gotten from a preview of next month's sequel from 2K Games: Bad things are coming. Previews of BioShock 2 hitting the Internet today, including this one, are based on the final two levels of what is likely to be the final preview version of the game released to the press. BioShock 2 is a return to the failed undersea Utopia of Rapture and is set, in its single-player mode, a decade after its hit predecessor. The game was delayed from its fall release and is now set to come out for early February. As of today, publisher 2K Games, which supplied the preview disc is allowing me to write about the Pauper's Drop and Siren Alley. Unwilling as I am to spoil events in the game I'm left to describe technology, gameplay features and mood of this new BioShock that puts you in the drill-hand diving suit of a mysterious early-prototype Big Daddy with mysteries abounding as to who you are, how a woman named Sofia Lamb rose to power in the wake of the fall of Rapture and what the fate of this place at the bottom of the Atlantic will be. Of the first, technology, my December write-up of the preview build's first three levels should suffice. The game looks quite good, runs smoothly, and only suffers, in its incomplete preview form, from the delayed loading of some textures, which can make detailed areas of the game world — a sign on a wall, for example — look a little blurry before they fully load in. Of the gameplay features, the main one not addressed in my December piece is the introduction, in Pauper's Drop, of an upgraded research camera system. The first game allowed players to snap still images of enemies and rewarded well-framed shots with points that accrued and unlocked new player powers or enhanced abilities against the type of enemy photographed. BioShock 2's camera shoots video, sort of. If the player selects the camera option, points at an enemy and pulls the trigger to activate it, the enemy glows gold and a ticker on the bottom left corner of the screen begins to roll up a count of numbers. Those numbers roll faster if you engage the enemy in combat and kill it well. After the kill, the tally is graded (Did you get a C? An A?) and the numbers are added to the research total, advancing progress toward the next of four unlockables for each enemy. Those unlocked features, as with the first game, are anything from new powers to new player potency against the filmed enemy. The video system is like the new game's system for protecting a Little Sister while she's harvesting Adam life energy (I wrote that in the last single-player preview). These are well-designed additions and alterations to playing a BioShock game. They incentivize players to do the things the first game made possible: Fighting strategically without fear of being aggressive in the process. What was largely an optional style in the first games isn't quite required but certainly more amply rewarded in this sequel. Technology, further plot details and gameplay aside, what struck me most about the new levels I played was the mood. An early signal, seen in one of the game's first levels, is that this game does not allow backtracking to previous levels. 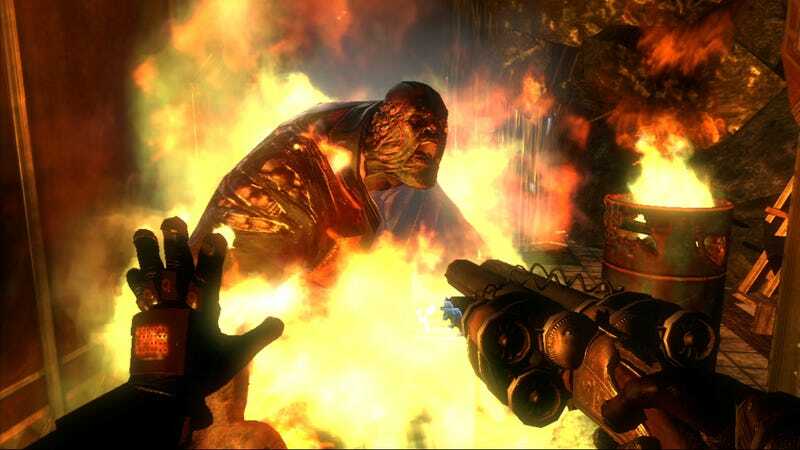 The player takes a train through Rapture to each new level and is warned each time, without much elegance or narrative justification, that a return visit will not be an option. The elimination of the option to backtrack seeds foreboding. Forging ahead offers many of the comforts of a BioShock: The reassurance of radio chatter from supposedly allied characters and even the orderliness of radio contact from one's nemesis. There are more moral choices to be made. Pauper's Drop offers one decision of life or death that would seemingly be without controversy. Little Sisters found throughout the game's levels, always accompanied by increasingly powerful Big Daddys, can, at any moment after their Daddy's been defeated, be harvested or saved, offering more choice, more sense of player agency and control. Yet that inability to backtrack is coupled with something else that makes the mind wander to life beyond (after?) Rapture: The sights of the sea. The clouded green waters outside the Rapture of the first BioShock have been replaced with the unnaturally bright light blue aquatic jungle outside the windows of Rapture in BioShock 2. Sharks and squid swim out there amid sea plants on this Atlantic Ocean floor that are colorful enough to be inviting. And out into this beautiful landscape you will go, more than once and not by choice. The sea is inviting. It makes Rapture feel like a relic of the past. The sense I get is that I am not long for Rapture or Rapture is not long for me. If Rapture is the star character of BioShock, I wonder with this new game, as I did not with the first, if it can die. Misdirection is possible. If the first BioShock is any indication, misdirection might even be mandatory. The dread is there anyway, mixed with the joy that two more levels down, the new BioShock 2 plays very well, keeps doling out powers and weapons and new enemy types. It is a game that's coming together well even if there's something — in terms of its fiction and the future of its famous city — that seems like it could be on the verge of blowing apart.